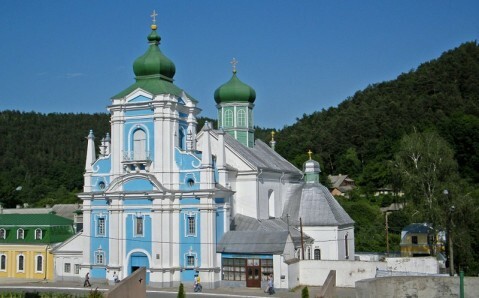 Pochayiv, a small town, would probably have remained off tourists’ radar, if it were not for its main treasure – the Holy Dormition Pochayiv Lavra. The cathedral’s golden cupolas are can be seen when one approaches the town. It is an important Orthodox religious center in Ukraine, second only to Kyiv’s Pechersk Lavra. It is curious that the cathedral is located in the west of the country, where the majority of population is Catholic. Pochayiv Lavra, one of the three most beautiful Orthodox monasteries of Eastern Europe, is located on a rocky hill, and it stands over 75 meters above the town, gazing down on its inhabitants. 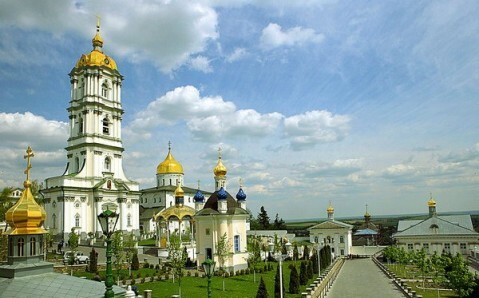 Believers come here because of the Lavra’s reputation for making miracles happen. Regular tourists come to see the architecture and the unusual energy of this land. A legend claims that the cloister appeared in the 13th century, when Orthodox monks fled from the Mongol-Tatar invasion, going west and settling on the mountain. The monks called it ‘Pochayiv’ in memory of the river Pochayna, where their monastery used to stand. The cloister’s first cells were caves deep inside the mountain; the first building was the wooden Church of Assumption. Soon after they settled, Virgin Mary appeared and left her footprint in a rock. 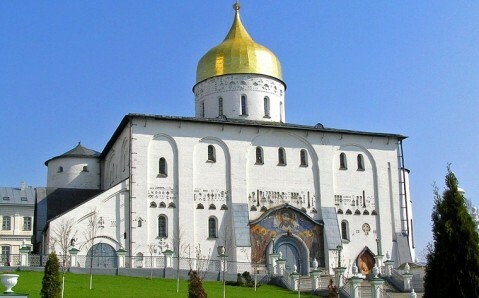 Pious believers think that healing water started to pour from the spot, and ‘The Footprint of Our Lady’ became the first miracle of the Pochayiv Lavra and its main relic. That legend made the cathedral famous throughout the whole world. By the 16th century, the monastery had become a center of the spiritual life in the western lands. Around that time, it got its second important relic – a miracle-working icon of the Theotokos. 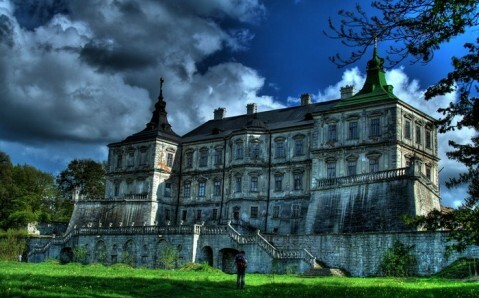 It was presented to the Pochayiv cloister by a local noblewoman, Anna Hojska, along with her extensive lands. Hojska claimed that her brother was cured from blindness by the icon’s power. Currently, two of Pchayiv Lavra’s most honored relics of are kept in its main temple, the Dorminition Cathedral. This grandiose building, constructed at the end of the 18th century in the late baroque style, is the Lavra’s dominant architectural landmark, and its main decoration. The Cathedral amazes with the beauty and splendor of its decoration - both exterior and interior. A well-known magnate, Count Mikołaj Potocki, funded it. One day, a legend claims, the count’s carriage turned over near Pochayiv, and he turned so angry that he wanted to shoot his coachman. But the coachman fixed his gaze on the Lavra, and the Count misfired three times! 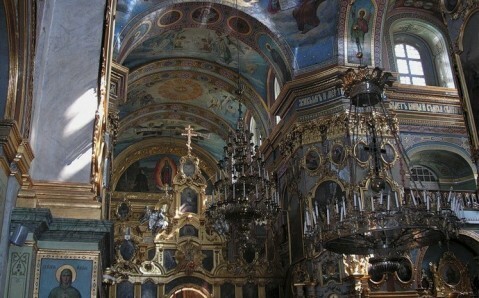 Amazed by this miracle, Potocki decided to devote his life to the monastery. Near the Dormition Cathedral is the temple of St. Job, also known as the Cave Church. 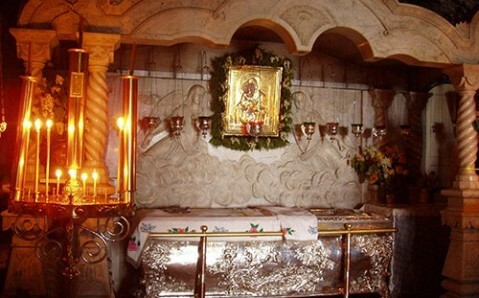 Relics of the Lavra’s former leader – Saint Job – are kept in a silver shrine. 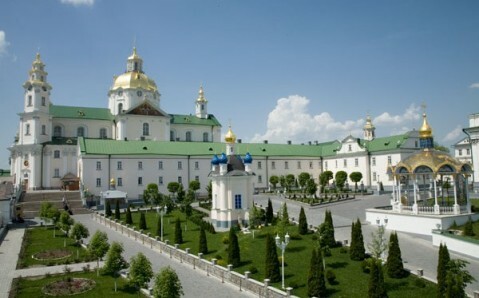 The Holy Gates, bishop's house, and 65-meter (213 feet) high bell tower are also a part of the Lavra's complex. The bell tower is the third highest in Ukraine. It has 25 bells, the largest one weighing 11.5 tons. Many religious tourists visit the Pochayiv Lavra on August 28th - the day of Dormition, and on September 10th - the day commemorating Saint Job. Women are allowed in the Lavra only in long skirts and with covered heads; scarves and skirts can be found by the entrance. Location: Pochayiv, ul. Vossoedineniya, 8. The best way to get there is from Ternopil; taxis and buses travel from there regularly (1hour, 20 UAH). You can also drive from Lviv (2.5 hours). Some tourists purchase tours to the Lavra from tourism agencies in Lviv, Ternopil, Kyiv, or other cities. Hours of operation: round the clock.